I think the people are the author, and what he regrets doing in his life. Like the king, he thought he was more powerful than everyone. The vain man, he thought he was better than everyone. The geographer, he thought every single detail was an important thing. The lamp lighter, everyday went by to fast. The drunkard, he would drink to much in the past. The business man, he would be to into his work. The characters all represent things he really regrets in his past. Oh and the flower is someone he misses and he left behind. Even when they were mean to him when they were they’re he misses them now. Finally, the Little Prince is like the authors memory going back to everything he regrets. I agree that they could be times the author regrets doing in his live time. There is something that I think differently about and that is that I think the flower could represent someone or something that the author loved but lost. Oh why thank you Sam! Because he probably thinks his life was horrible in the past and is thinking about it! I agree as well. It may represent that… But I kind of think it’s different. Maybe the flower is someone he thought of… Like maybe his friend misses someone… But that is a small thought. But I really agree on it was probably people he thought about. I agree. I think that the flower is a symbol in the authors life. The flower might smybolize his wife and how much he misses her when he went away to join the war, same thing in the story, the flower might be the Little Prince’s wife and he is sad that he left her and he misses her. I like your idea, I think instead of the drunkard being really a drunk man I think its was him stuck in a non-stop routine because Mr.Curtis was talking about symbolism ,and i think the drunkard is a symbol for that. The strange characters in the book represent times in the authors life that he now regrets. When the little prince visited the king the author was referring to a time in the authors life when he thought he was in control of everything. the vain man is from a time in he authors life when he was arrogant and thaught he was to good for anything. the drunkard is from when the author was depressed and turned to alcohol to relieve stress. Don’t worry about spelling, worry about people’s ideas. All the characters could be people from the authors past. the flower may have been someone that the author loved. the king could be a bully from the authors past who thought he had power but was wrong. the drunkard could have been a person the author tried to help with his drinking problem. the business man could be someone who was to much into his work and couldn’t stop thinking about it. the lamplighter may be someone who was very serious about his job. the geographer may be a person who thinks that details are the most important thing. That is what i think. Lindsay that was my idea too! In the story, the little prince, I think the author is actually trying to represent different types of people through all the people the little prince has met at all of the planets he has visited. Like for example, the Vain Man represents people on earth who think they are greater than everything and everyone else, and think they are a gift to the world. Also, the drunkard represents people who are ashamed of what they are do, but can’t stop what they are doing. Also, the business man represents all people who take everything too seriously, and don’t have time for anything else. The lamp lighter represents people who are loyal to others. The geographer represents people who are curious about the world. And lastly, the king represents people who wish they have authority over everything. I totally agree with what you are explaining! You gave great explanations on what each character could represent. I think your idea might be what the author is trying to say. I totally agree with you!!! 100% I do think that the characters are really like that in the real world. Excellant explanation!!! The 6 men represent bad habits that possibly the author has had in the past. The little Prince symbolizes him regretting and wondering why he did those things. All of these habits had their own little “world” that ignored the rest of his life, until the geographer recommended planet Earth, saying that he should try leaving these little “worlds” and pay attention to his life and get rid of these bad habits. I understand what you are trying to say but i don’t fully agree. I think that the author wrote this book to write how he was like the 6 men at one point. I understand what you are saying but i thought something different. There are many characters in The Little Prince, but at this point we all know that they relate in some way. I believe that the characters in The Little Prince relate to the random people in the world. These people probably effected the author, and he wanted to show them what fools they’re making of themselves. For an example, the man who cared only of himself was probably someone in the author’s life who effected him by only caring of himself! The author wanted to express a lesson to his readers with his characters. I believe the characters might also represent people that the a author dislikes. This is what I think the characters represent in The Little Prince! I really like your idea about how they are people in his life that are fools. I like how you said he is trying to show them what fools they are. I like your idea about the people in his life. Like how you gave details about why this persons was who he is. I agree that the author wanted to show the people what fools they are making o themselves. It makes total sense. as i was saying the author or narrator was most likely a poser a vain man a drunkie a business man then a man who worked his life away and last but not least he was a geographer with no one to help identify the land. another thing that could be a possibility is that he had to leave his family to go fight in a war and all of the different people that the little prince meets in his way to earth are different figures in the army. for instance a poser could be a commendon or commander and the vain man was/is a soldier that wants everything. the drunkard is probably another soldier, while the combat officer was once a business man. then as another soldier reals himself to be a man who worked away his life and or family. finally the geographer, the little prince gets a glance of how his life turned out how he had lost all sense of creativity and adventure because the adults in his life forced it out of him and now he cant even go out find a mountain on draw it on a piece of paper for goodness sakes! 1. King- I think this character might be a time of the author’s life where he thought he had could control the things that he wanted. But really the King had no real power. I think this because this is how the king acted and the author must have some reason or way he was able to create the character of the King. 2. Vain Man- I think this character might be another time of the author’s life where he thought he was ” awesome”. He wanted to see and hear appreciation from his admirers. I think this because he thought he was amazing for fighting in the war for his country. 6. Geographer- This character might of been a person in the author’s life who judged everybody. He only talked to people that were important to him. I think this because he wouldn’t put the friend of the Little Prince, the flower on the map. 5. Lamplighter- This character might of been a personality that the author once had. The lamplighter just carried out his orders. I think this because the lamplighter no matter what, just kept lighting and taking away the light of the post. 3. Drunkard- I think that this character might of been a time of the author’s life that he regrets. He is ashamed of doing this, but he cant really stop it. I think this because there is a never ending pattern shown in the story about this habit. 4. Business Man- I think this character might represent a time of the author’s life where he was focused most on his work. In the story, the man keeps purchasing stars because it is what he wants to own. Yes. It’s almost as if the people are living without a reason. They aren’t doing anything to have a purpose in life and if there is no purpose in life, what is the point of living? If one is to not make a difference, why keep doing what they are doing? We are here to make a difference and if we don’t make a difference we are merely dust in the wind. That is the meaning of life. That is why we are on this planet. In The Little Prince the six people are somehow related. I have two different explanations for the six people. My first explanation is that ,like Nate, those six people represent his former self. When the Little Prince was traveling to those “little planets” that the Little Prince is visiting is really him looking back into the past. Another explanation is that those six people are six different ways people look at the world. I agree with you. They could be long lost brothers, or cousins ,or uncles, aunts ,mom,dad. I agree with every word. I see how those planets could represent him looking into the past. Especially the drunkard. I also agree with the people at the planets are the different ways that people look at the world. I think the people from the little prince are people who the author couldn’t worked for or met in some point in his life. Like the king was a boss person he worked for the vain man might be a person he met who thought he was so much better then anyone else. The Prince and the flower could be him and the a person he loved like a wife or girlfriend. The drunkard could be the author when he was drunk and he drunk a lot to forgot about some bad things in life. The lamplighter could be a person who is trustworthy to his job and loyal to his orders. The King- this King could be someone that the author worked for, who thought he had control over everyone and everything, but really had no power. The Vain Man- by the way he made the Little Prince clap for him, he sounds kind of like a bad friend, the “I tell you what to do, you do it” type of guy. He left because the “friend” was like a bully. Drunkard- this could have been the author himself. He did something bad, but did the wrong thing to try to heal himself. Businessman-this could have been his father. He had no time for any sort of fun or games, so he left. Lamplighter- this could have been someone the author had admired, but he couldn’t separate him from his job, which soon became ridiculous. Geographer- this was the advice giver, the only one who “pointed him in the right direction”, the only one who had ever been helpful. I agree. I think that you gave very good explanations and creativity. I think that some of the characters might be people that were his father or the author himself. Good work! Great explanation. I would have never thought of that. Thanks everyone!!!! I’m glad you liked my comment. Well, for a start i would have to say that i think the king,vain man,drunkard,lamplighter,business man,and geographer are like people he was or wanted to be or people that he knew why i think is the main story about him because maybe he was the little prince and that the people he knew or wanted to be or was. I agree mostly. Just to add to it, the planets could be homes of the people that they could be. Good point ! I agree. There are about eight people inside the book. I believe they some way relate to the author. I Believe the flower is a girl that the author loved. When he went off to war he left her behind. I believe that he really regrets leaving her behind. The business man is probably his dad. his dad might not have had enough time for him. The king is probably his teacher at school, thinking that they are oh so powerful. That is really good point . I agree with what you are saying. I think the flower idea is a REALLY GREAT idea that I would never have thought of because it is so creative. Also the other characters are good to but i think the flower was the best idea. You have a good point.I agree. wow i really like the paragraph because it is like his real life thats what i agree with so what other things do u think because i want to see what other things you have because they are very good predictions. I also believe that the lamplighter is one of his good friends that he really wants to help his good friend get out of a endless circle. But his friend is so caught up in the circle that he can not help him. The drunkard in real life could be his older brother. His older brother tries to tell him something that is really depressing in his life but the boy can’t understand why he’s upset, only that he wants to help him but he feels really bad. I agree of how the flower can be a girl who he loved and left behind. I would of never thought of that. I thought the 6 characters meant what people are like(traits). In the book, the prince see adults as weird. What I am begining to see is that this book is telling us what all adults are like. That is what I think, too but I also think that it is about the author’s family and the Little Prince represents the author so he talks about how the author’s life was like and what he thought about who. That’s a good idea too Chris i never thought about that. I disagree a little. I think The Little Prince sees some adults stuck in a circle they can’t get out of, one is stuck in a job that he can’t sleep because his planet is moving so fast, and the others are wanting to be rich or make maps. Sorry again but I don’t think that is what it means either , Collin. Than what does it mean Eva? I disagree to. I believe that they are not his family. I believe that they are friends or adults that he doesn’t understand. When I really sat down and thought of this question I kept thinking of who or what these characters could represent. I thought the king, vain man, geographer, lamplighter, drunkard, and the business man could all represent the author/narrator. I think this because this book was written sort of during the time of WWII, and the author was in the air force. So maybe he knew that he had to leave to fight in the war, so it maybe made him sad so he took on these multiple personalities such as all of the characters the Little Prince has encountered in these last few chapters. That is before he wrote this story anyways. Like for example, The drunkard, he drank to forget to forget that he was ashamed of drinking. Maybe that same thing happened to the author but he drank because he had to go into war and he didn’t want to leave his family/wife and never come back. I think the author , like the king tried to control everything that came in his way about the war. Thinking that he was the most powerful man and could take down any plane. I think he could of been like the Vain Man because something or someone might of effected him to only think of himself. The geographer could also represent the author because he might of made his own maps? Or maybe he had a close friend that he lost was a geographer? I kind of think of the author representing the lamplighter by always having to be in the war and never being able to rest? And finally i think the business man because it kind of seamed as if in the story the business man had no time for anything. So i think that the author represents the man. And his work, flying war planes in the air force. Making him the “business man”. And since he had no time, maybe that’s how he was to his family before he left and had to report to the air field. Oh and I also think that the flower could of represented a close one. Or even a girl he was in love with that he had to leave. Or she may of left the author. i agree but i think the flower is his wife. When he joined the war he had to leave his wife. I agree that the flower could a girl he was in love with or someone close to him. I also think it could be a time he lost someone or something he loved. I think you wrote a very good response, but I still think the characters represent more of the people in the author’s life than him in general. Overall, great response! It was very touching but I just want to know what, what made you think of that? Thanks! I thought of this because the interactions between the characters. And how the flower acted when she knew they had to leave. And it just made me think of that right away. I think that those people he keeps meeting are maybe his family and that he misses them. Also maybe his mind is making these people that he might be people he knew in his life and might be people he knew back when he was little and maybe the king was his dad. Also the flower could have been his mother. The drunk dude could of been 1 of his friends when he was little. Maybe the boy he met was him when he was a child and he has some how gone to the past. Also maybe the geographer was a long lost relative. All the characters in The Little Prince book we are reading in class have to represent something. I think that the King character represents maybe a family member of a father. I think the King represents a father is because maybe the Little Prince had a father that used to boss everyone around and think that he can control everyone he knows and also doesn’t have a clue someone is. Also another character The Little Prince met was the Vain Man. The Vain Man was a person that thought he was self centered. I think the Vain Man also represented maybe a family member like a brother that thought that The Little Prince was always admiring him and every time The Little Prince would clap the brother would always think it is always for him no matter what. The third person The Little Prince met was the Drunkard. I think the Drunkard represented someone that The Little Prince has met on the sidewalk and he didn’t even know him. So The Little Prince would talk to him and see what he was so sad about. Then the person the The Little Prince met on the sidewalk told him that he drinked alcohol and was ashamed of it. There are still some more characters in this story but I think that all the characters including The Little Prince was made to represent who the author met and what happened in his life. So I think that this book and the characters were made to represent what and who the author met. This is what I think the characters represent in the story that The Little Prince. I also think that The Little Prince represented the author and what happened in his life. This is what i think of who and what the characters in the story The Little Prince represent. I think that the king might be someone in his life who thought they were all powerful but weren’t, like a kid in his life. Kids always think that they can do anything because that age hasn’t come yet where the kid realizes that there are things in the world that can stop you from doing what you think and want to do when you grow up. The Vain Man might be someone in his life who thought they were the best person in the world and thinks that everyone must admire him for his greatness. Almost like some musicians. They think that if their fans think one song is good that all their songs will be good. The drunkard might be someone who thought that doing something (drinking in this case) that would make them forget that they shouldn’t have done that something before. I think that the king would represent presedent, because he would have a lot of control over people. I think that the vain man might represent a friend that was in the war with him that is very self centered, because he went to war and he might have met a lot of people. I think the drunkard would represent someone he saw on the b street, because there are a lot of drunken people on the streets that are ashamed of what they have done. I think the business man would represent a parent that don’t have time for their children, because many parents are work a holics. The lamplighter would represent a person he probably met when he was a kid that works too much, because he took pity on this grown up because the lamplighter was working for someone else because he needs to, not because he wants to. The geographer would probably represent a teacher or kid that is too achademic and not athletic enough. I think this because the geographer only cares about his maps, not the thought of actually going to the places. The flower might represent someone he misses dearly and he wishes he could see again, because he misses the flower and wants to see it again. I think the people in the Little Prince actually represent is like feelings that the author had in his life. For example like the business man, he felt like he was always busy and only had time for work. Also for the vain man, he felt like he was better then anyone at one point in life. Also for the drunkard, that he felt upset about repeating something in life and he couldn’t stop thinking about it or doing it. I think the lamplighter he felt, that life seemed slow but it actually going really fast. I agree that was a good idea now i have a better idea on what the author might be trying to say. that’s exactly what I thought! Especially about the part how the author is trapped repeating something he really doesn’t want to go on anymore. That makes perfect sense considering he had to leave everything behind to go fight in the war, risking anything and everything he cherished. I understand because i like how you explain your ideas to his feelings because you changed the idea of the people in this class did the people and you did the feelings thats cool. Excellant explanation!!!! I truly believe that really is the truth behind the story. Great job!!! the little prince goes and a journey to other small planets and meets people that are very strange. there is a king, lamplighter, vain man, drunkard, business man, and a geographer. all these people might represent someone or something in the real world. than he goes to earth and finds the author in the desert fixing his plane. I think that all the characters in the book are the people he was in life. He is showing us that he was a boy that did not like grown ups like that who were boring and not imaginative but it turns out when he grew up he was that boring kind of person. He did not like being that kind of person so he wrote this book to show when he was a kid how much he did not like grown ups like that but he is also showing that he was that kind of grown up. I think the people are his friends and family. The Little Prince has to help his friends with their problems that they have. The king could be his dad and maybe the drunkard is someone he sees at his house drinking because its his dads friend. The lamplighter could be a guy that he knows from the electricity store. The geographer could be a weather man he sees on the weather channel. Finally the vain man could be a guy he met that bossed him around and was being mean to him. I think that the strange characters are things the author regret doing in his past. The king can represent the time the author thought he was in control and in charge of everything and everyone. The vain man can represent when the author thought he was better than everybody. The drunkard can represent the time he was trying to forget about being ashamed of drinking so he was drinking. The business man can represent the time he couldn’t stop working like if something happened to his family. The lamplighter can represent the time that the author thought the day were to short he couldn’t do anything. the geographer can represent the time the author wanted to explore the world. The flower might represent the time the author lost someone or something he loved. That’s an awesome idea ! I only wish we knew the truth behind the author’s story ! I fully agree with what you’re saying. It makes perfect sense ! I think that the characters represents groups of people in the world.Like the king can represent dads who think they have the pants in the house but the mom really has the pants. The flower is moms who is seeing their son/daughter leaving. And how the flower was going to cry right after he moms cry when you leave the nest. I think the vain man is represented as people who think they are their all that and think their better than everything. The geographer are people who are curious of the world and many other things. The lamplighter is people who are respectful and do what their suppose to do. The business man are people who get into their work to much and dont have time for anything or anyone else. I think the characters in the book The Little prince represent the times in the authors life that were bad and that he regretted. For example, I think the drunkard is the time that he was really depressed. Also, the vain man might be him when he was very selfish and mean. The flower might be the people in his family that he left to go join the war. Finally, the king might be him when he thought he was in control of everything. I think that the characters are some people in his family and in his daily life. I think that the businessman might be his dad because he could really busy when he said that he is very busy and buys all these things that he came up with first. The vain man could be someone in his neighborhood because they would walk around thinking that the man is better than everyone and things that he is so great and powerful. I think that the lamplighter could be his neighbor because he would work all of the time and doesn’t have time to do anything like sleep and eat and when he works more than he feels like the days are getting shorter. The geographer could be some he know who doesn’t want to explore around and doesn’t want to put anything in a book for other people to explore and he doesn’t want to explore other plants and make maps for those other planets. The drunkard could be a friend of his dad’s and he wants to forget about being ashamed of drinking so he drinks more and more and he feels bad that the man is in that kind of problem and that he can’t get him out of that problem or help him. I think that the king was some person who thought when they tell the sun to set or the bell to ring that its going to do it at the time that it will so he says that it will ring at that the time and it will any way. That is what I thought that drunkard was, the businessman was, the lamplighter was, the king was, the geographer was, and the vain man was and that is what I thought they were all. I think he thought he was a king when he was drunk and he liked the way of thinking he had power. Also when he was drunk and thinking he was a king he was also a vain man which he didn’t want to be earthier. Then he might have been thinking to him self that he needs a job and when he started he got stuck in a routine and then started really caring and got really insane about his work and the lamplighter is him telling you that his life is going by to fast from the routine and had to get out. So he started being a pilot and had to know were he was going so also became a geographer. I think that all of his characters are people he had met in his life. The king is a person who thinks he is in charge when there is nothing to be in charge of. The vain man is a person who is self center which means he only hears the things people say good about him and ignores the bad things people say about him. I think he knows people in his life that are stuck in a cycle so he made the drunkard man. He drinks so he forgets that he is a ashamed of drinking so he drinks more to forget he is ashamed but he still drinks and cant stop because he is ashamed of is. The business man is a man who wants to be rich by owning things that are not owned by anyone like stars. He also has been stuck in a cycle like the drunkard. The lamplighter is a very committed person into his work. The geographer is a person who graphs places and things. He sends other people to explore places. From the book ”The Little Price”, the 6 characters can represent people from the real world. I think that the geographer is like an author. The drunkard sound like someone who is depressed most of the time. The business man could be a scientist. The king could go for someone who is very demandful. Vain man is someone who wants all the attention. Last but not least the lamplighter is like someone who works too hard and barely gets any sleep. He is also like someone who barely speaks, he’s always quiet. I agree with you, some of those explanations you gave could really be the truth behind the story!! I think the characters represent the authors family in the Little Prince. Like how the businessman could be his father, never really talking to him or taking him places because he has so much work to do. The king in the book could be his older brother always thinking that he rules over him. For example he could say pick up that ball when he is already doing it. The lamplighter could be one of his younger siblings always doing what they are asked to do. The vain man could be someone in his town that only listens to things that are nice, like a priest. The drunkard my be someone in his life that is in misery and cant get out of it. The geographer could have been someone in his family that wanted to do something but couldn’t do it. And last but not least the flower reminds me of a mom, always telling you what to do and sometimes it gets annoying. But since the Little Prince left he misses his flower. Great details!! I think that it is very good and that might be the truth behind the story! 1.KING-People that think they can boss everyone around. 2.VAIN MAN-People who think others cannot live without. 3.BUSINESS MAN-People that have no time for anything but business. 4.DRUNKARD-People that feel ashamed of themselves. 5.LAMPLIGHTER-People who are always sad from no sleep because of their job. 6.GEOGRAPHER-People who make no sense at their job because there is no exploror to search for what there is. i think that all those people are that like the business man who has no reason. I also agree but they kinda have a reason. I don’t think you should list everything and you should have wrote it in a different manner. You are writing it pretty much exactly the way it is in the book. i know that but for people that havent read the book yet that is a basic summary of the people. i agree that is mainly true about all people like that and with those problems. In the book “The Little Prince” the 6 characters all have these bad little habits that have no point in them really.Except the lamplighter he is suppose to light up the lamp for a reason. The bad habit from the Business man is he counts stars and thinks that they’re his stars.But the lamp lighter is the one with a reason. i agree but i think you should explain everything. I agree with Pete because Ricky does need to explain more about the characters in the little prince. i agree they all have a habit but what are some other habit they have. I do not understand AvantaybB can u explane it more? Thanks! One way these strange characters represent people would be by there personalities. For example, the lamplighter. He represents people who feel like there jobs don’t have breaks. In his case, it is. Another good example would be the drunkard. He represents all the people who are drunk because they are ashamed of themselves. Wouldn’t you agree? I agree with you because those character do act like and they kind of tell how they act about their life. i agree because it probably some one in the real world. But, onthe other hand i don’t, sorry Dr. Jones, but i think that they might be his parents. I say this only because most authors make there characters out of people they know, maybe there parents where nice sometimes it mean and never payed attention to them. Maybe there parents, like there dad, was always drunk. I like your idea. It makes a lot of sense. It just make sense by how you said it. I do agree but i think Doctor Jones kinda did a good job. I totally agree Dr. Jones! I think this because he went into detail about the characters as if he knew them, so that gave me the idea that the characters represent someone in the authors life. In the story the Little Prince the Little Prince meet’s a group of different people that (own) there own planet’s and each of these adult’s are all very different from each other but are all still stuck in the never ending circle’s that make up them and there lives. I think that the author of the Little Prince based all of the characters in the story off of different people he has meet in his life. people such as the businessman , the drunkard , the lamplighter , and the geographer.The little prince is just a wandering little kid who just wants someplace to fit in , and that place is home. I think you are right, but I think you need to tell a little about those characters. Like, who they are, what people are like them. Describe a little. Maybe like how the king is craving power. I agree with that because it makes sense for the adults to be creepy in that book otherwise the book would be less funny. I think the 6 characters are him at different points in his life. The king could have been him when he was little because most little kids think they control everything. The Vain Man could have been him at one time when he thought everyone loved him. The Business man could have been him when he felt like he was to busy to do anything else but work. The Drunkard could have been him when he was stuck in a non-stop pattern. The lamp lighter was him when he felt like he was doing something pointless for no reason at all. Lastly the Geographer was him when he was to curious about everything. that is just my idea but I really wish I could no the real story behind it! I wish i knew what he was talking about two because, when i was a kid i thought i ruled the world even though i definetly did not i wanted to belive i did so i agree with what you are saying . I thought the king was a man that thinks he can control anything when it happens. For the vain man he was like a guy that thinks he is better then any one he see and thinks. The geographer acted like a guy who can’t do fun things with his job.With the lamplighter he is like a guy who never gets to do anything but his job with no fun.The drunkard acted like a sad man that hides his pain because what he does. And the business man at like a guy who just cares about his job and money and to buy things and sell them for more money.So that is what I think the characters are like from the little prince. I think that the author has been like one of those people in the book at some point in time. So maybe he was like the king thinking he was powerful but he really wasn’t. Or he was like the Vainman thinking he was so important and everybody want to be his best friend or live to praise him. Or maybe he was doing something point less like the geographer or the lamplighter. The geographer he makes maps of his planets only he need an explorer to help him find out what his planet looks like but he doesn’t. The lamplighter just does his job over and over again but its point less because his days are only 1minute long. So basically what trying to say is that the author wrote this book about all the silly thing he did or saw and made it into a book about all the point less things adults do. 100% awesome!!! Great truth behind story!!!! I agree, they just show the different sides of the author through his life. I think that the author was trying to say that the characters in the book are like people in real life. Like the vain man and the king are like people today that think they have power and are all that but really when they have none of that. Then there is the people that are like the geographer and the lamplighter that do things that won’t help them or anybody. then there is the last people who are like the drunkard and the business man that get into things that they can’t get out of. Kind of like a circle. I agree, I had the same ideas as you. I agree because I also think the characters seem as if it was someone in the authors life. In the story The Little Prince, there are 6 people the Little Price meets on his adventure. Some people think the people are the author. Others think it’s people in the authors life. I think it’s both. Like the business man could be his friend in the war that takes his life too seriously. and the lamp lighter could be a person he knew that did everything he was told to do. The king could be the author when he was a pilot. The other characters don’t sound like how the author would act. But that’s just me. I think that is a greeeeeeeeeaaaaaaaat idea! I’m so smart?!?!?!?!?!?!? i do not really get it. why did you not say any thing about the geographer? the king is small and thinks that adults have no imagination.the little king is also in love with a flower (rose).And on his planet whatever you draw on the earth becomes real on his planet.and on his planet he needs a sheep to eat all of the trees and banzai trees so that way they dont get to full size and crush his planet.the little prince also leaves his planet because he is mad at the flower.and once he gets to earth he realizes that shes not bad and starts misses her. I think the author created the unique characters because he knew people like them. The King is someone who thinks he is the boss of others , when people disobey him he doesn’t like it so he demands them to disobey him. The vain man Is cocky , that means he thinks he’s better then everything and everyone else. The geographer is someone who takes others peoples advantage of people and makes either their stories and makes it seems as if he created them. The lamplighter is someone who like takes pride in his work and does what he is told. The drunkard is someone who reminds me of someone who knows he doesn’t make good choices and doesn’t want to think about it, because he already knows it’s wrong. He creates a cycle for himself , he drinks because he is ashamed of drinking and goes on and on. The business man is someone who doesn’t have enough time for anyone or anything except his/her work. I think the flower represents someone the author loved that either left him or he left her , and now he misses her. I agree with you a hundred percent. How you described the characters makes it so easy to understand what you are trying to say. I think that is an outstanding way to look at it! The way you explained the characters is so easy to understand. Well i thought mostly of two main ideas of what those weird character were trying to represent. The first was that maybe the author was trying to describe different characteristics of how he felt in different parts of his life. For example when he met the lamplighter might resemble him maybe when he was in the army or what ever and when he was loyal to orders. Or when he met the business man might be the time when he was to serious to do anything except work all the time. And when he met the king, that’s probably thought he had more power than anyone. Also with the vain man and the geographer i think that was when he was to good for mostly everything and when he thought he could take advantage of other peoples work. Because that what i thought the geographer was doing with the little prince. The second idea i thought the author was trying to say was that each characteristic for each weird character. Described why adults are like why they are . And why they have no imagination. I thought that because in the begging of the story that’s what he talked about with the boa constrictor eating an elephant. maybe the was saying that adults can act like they are to serious or to vain or like they are the most powerful person in the world. I think that you have a great idea of how you think the author might be expressing parts of his own life through the characters. I think that the 6 characters are a symbol in the authors life. The king is someone who thinks that he is in control and gives orders that are going to happen already. The vain man is someone who is very stuck up. The vain man is someone who is stuck up and selfish and if you don’t say something nice about him then he wont be able to hear what you had to say about him. The drunkard is probably someone who was once really sad or depressed because of his life or something that he did so he started to drink and over a long period of time he forgot why he was sad so he blamed his sadness on him drinking. Another character is the business man. I think that the business man is someone in the authors life who didn’t really spend time with him and didn’t get to know him because he is a busy man. Also there is a character called the lamplighter. The lamplighter I fell bad for because he is very loyal to his job so he can’t get to do things that he would like to do, for example, he wants to sleep but he can’t because his planet is moving so fast that he can’t get to do things he wants to do because he has to light his lamp then turn it off every minute. I really don’t know what the geographer symbolizes. He always has to stay on his planet because if he leaves then someone might come to his planet and miss the opportunity to get more people to help him out on his book. Each of those characters is probably a symbol in the authors life but you never know. It would be cool to find out!!! Wowzeee!!! From what you wrote, that was what the author was getting at . I thought the six characters might represent many different people. KING – The King might represent people who crave authority over someone or something. This may be the case of someone who thinks they own everything and are very bossy. But also is very reasonable and won’t give impossible requests. VAIN MAN – The Vain Man represents many different people. I might be getting a little confused over this, so I’ll tell the best I can. I thought he represents self centered people, arrogant meaning the same. When you compliment them, they are not polite about it. Actually, they are kinda scummy about being complimented. They think they should be the best thing ever. GEOGRAPHER – This adult was reasonable. He wasn’t absolutely nuts, but he was kind of misleading. He was also about the same as some people who are know it alls. LAMPLIGHTER – He made perfect sense… Sort of. Who could give him orders? I don’t know. But he is like people who hate their jobs. Some do their jobs 24/7 like this. DRUNKARD – He was like people stuck in a never ending rut. Like a daily routine that makes no sense. BUSINESS MAN – This is workoholic people. They take their jobs too seriously and never have any fun. They have no time to do anything kid like. The people may repusant some of his friends that he had.Like the can be a bossy rude mean friend .The drunker can be a friend that can be always ashamed of himself.The king be a friend that thought he ruled everything.the vain man is someone who he sees,is bleasing him.The lamplighters loves lamps.The business man has a huge business. I’m not saying you are wrong, but I think they represented some things that the author went through. I think the lamplighter is like people who hate their jobs.. Not love lamps. I just think it’s a bit different. Ya but the lamplighter can really love lamps. l think the author made them be weird because he wants it to be funny. The little prince has his own world he made with his imagination. The author used his imagination to think of funny guys. He trying to make the reader laugh but also keep reading. The king reminds me of an annoying adult who thinks they have control over anyone that is younger than them. The vain man reminds me of a movie stay who thinks their better than anyone who’s not famous. The geographer reminds me of a student receiving information and copying it in his notes. The lamplighter reminds me of a dog taking orders from its master. The drunkard reminds me of a person eating to get rid of their stress. The business man reminds me of a person taking advantage of things that aren’t his. You do have a point but many movie star care about others. All I’m trying to say is that most movie stars are full of themselves. l agree the king does remind me of a adult because he is boring but not really annoying. the 6 characters I think were people he knew before the war and people he met during the war. for example the business man I think was mabe is father. I think this because a lot of people want thier family to have a good life but never spend any of thier time with the family. I think the lamp lighter was a friend that the author met during the war. I think this because a lot of people care more about the friends in life then themselfs. I think that the king was germany. I think this because some times in war the other countries think they are all big and bad but they are not.i think the geographer is his mom because moms always try to make every thing look nice and easy. i think the drunkard was one of the uncles of the author. i think this because lots of uncles are just really weird and love to drink and wants to but at the same time does not want to stop drinking. and last the vain man i thought was a brother or sister. i think this because some brothers and sisters think thier other brothers and or sisters wihtout them! 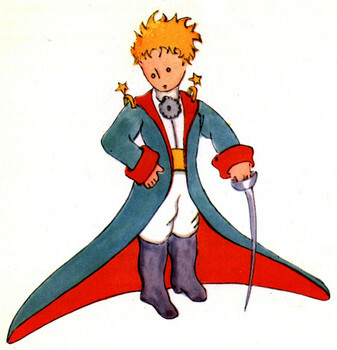 The characters in The Little Prince each represent something different. THE VAIN MAN reminds me of people who think way to highly of themselves. For example, Donald Trump is very arrogant and full of himself. THE KING reminds me of Prince John in Robin Hood because Prince John was not actually the King in the story (King Richard only left for a short while). THE DRUNKARD reminds me of people who are depressed and ashamed of themselves. THE BUSINESS MAN represents people who take things too seriously and worry to much. THE LAMPLIGHTER reminds me of school teachers in a way. I think this way because they are told to do things by higher ups and have to do their job right. THE GEOGRAPHER reminds me of people who have jobs with no real meaning. The little prince has met silly characters in the book.I think in my opinion is that these characters represents the life of the author.The king represents of his stage when he had imagination.The vain man represents of how he felt about adults having no imagination. The business man represents on how he started his job and was difficult. The lamplighter person represents on how he worked really hard on his job. The geographer represents on how the author had his education since he had an interest in geography since he was a pilot in a war. That’s how I thought of the characters of each character. In the story , The Little Prince, he meets strange adults who do things he doesn’t quite understand. I believe these people were family and friends he knew. For example, when the Little Prince leaves the flower. This may represent when the author left his mother or wife. I believe that in The Little Prince each of the odd people that the prince meets is someone the author has met. Maybe each person helped him in some way. Either that or they did the opposite and hurt him in some way. Hopefully, as we read on we will figure out who all of these odd people are. To me each character is a thing that describes the authors life. The king is what he thought he was when he was little. As he got older he became full of himself like the vain man. He then got older and started to drink and regretted it, just like the drunkard. He finally got a job, but worked to hard and was to serious about his job that he never got any time to spend with his family. Just like the business man. On the other hand the lamplighter explained his feelings, one moment he was happy (The light was on) The next moment he was sad (The light went out). The geographer to me shows how he wants to go to war, but doesn’t want to leave anyone, just like the geographer wants to learn things, but is not allowed to go and find this stuff out. In conclusion I believe that the author wanted to tell the world about his life, but he wanted to make it interesting so that people would read and enjoy his book. I totally agree with what you are explaining! I think you make a great point that the characters represent a part of the author’s life. To add, I would say that the characters represent mistakes and accomplishments in the author’s life. Or they represent what a fool the author has made of himself in the past or event when he wrote the book! Overall, it was a great response!!! yes it does kind of sound like it from the authors life that’s what kind of makes it funny. I think the people the Little Prince has met are symbols of life, and also lessons to learn in life. Some of the lessons are what to do with life and some are what not to do in life. For Example what not to do would become a drunkard and not care about yourself. A good lesson would be a business man, or a geographer, or even a lamplighter, or a king. Another important lesson for what not to do with your life is become vain of yourself. For example, going around thinking your better than everyone else,when everyone is at the same level of skills. I think that is a G R E A T way to look at it! I think that the little prince is actually the author. The flower is his wife that he left when he went to join the war. He joined the war to get away from his wife but then started to miss his wife. Now he is meeting all these people who are doing ridiculous things that have no effect on anything at all but themselves. I think these people represent the different countries or governments he meets when he is on his way to the war. There are 6 people that the little prince means the king, the vain man, the drunkard, the business man, the lamplighter, and the geographer. I think that all of the people that he meets are stages of him in life as a child he is a lamplighter following orders and then as his life progresses he gets different jobs and is in different stages of his life where the people he meets represent them. The characters in the book are regular people that live in are everyday lives. The king is someone who wants to everything and wants everything. The vain man is like a person who tries hard to be popular. On the other hand, the geographer wants to help people by helping map things out. The lamplighter has the same characteristics. He follows orders and does what has to be done to help people see. The drunk man is someone who does not know what to do with his life. The business man is someone who has time to answer questions but has to keep on getting richer and is greedy. Those are what these people in the book mean to me. In the little prince I believe that everything and everyone that he has seen in his adventure represents something or someone in the real world. For example in the story the little prince visits a vein man that believes he is a gift to the universe, when really he is just seen as an arrogant man. So that leads me to think that the vein man represents all of the people in the world that think that they are better in every way compared to anyone else. Another example is the drunkard. I believe that he represents everyone in the world that regrets things that they have done but instead of solving their issues the right way, they take the wrong path and resolve to things that are bad for you, like drugs and alcohol. But in the end the charters can actually mean anything, it all depends on perspective. You could look at it as they are people in the little prince’s life or you could see them as different types of people in the world. There really isn’t a wrong answer to the question. That how I think of it too! I think that the people in The Little Prince, represent the author in a time of his life. The king could be when the author thought he ruled over people and could tell them what do to. The vain man is when the author was kind of selfish and thought he was better then everyone else. The author could of had a bad drinking problem during his life, which is what the drunkard was for. Or he cold of been to focused for work and didn’t have time to do anything else like the business man. The lamplighter and geographer also stand for sometime in the author’s life. They show all of the good and bad sides of the author. I agree with you !!! i Thought that he once was the six men at one point and time. We thought the same thing!!! Good Job Brii !!! The businessman is from a time in the authors life when he forgot that he didn’t like grownups and he was acting like one himself. when the author was in the air force he had to take ridiculous orders like flying through German controlled skies. that is kind of similar to the lamp lighter. I really dont know who the geographer represents. To me I think these characters represent times in the author’s life that he now regrets. For example I think the King shows the time in the author’s life when he thought he controlled everything. It was also when he thought he should rule over all the people and they shall obey him. The vain man might represent a time in the author’s when he thought he was to good for anything. He also wanted everyone to admire him for how awesome he was because he fought in a war for his country. The drunkard is probably a time in the author’s life when he was an alcoholic or stressed out. He drank to relieve is stress. I think the business man is when the author was very busy at one point in time. During this time he couldn’t spend time with his loved ones because he had so much work to do. The lamplighter could represent how the author felt or his personality. He lit the light, but then took the light away from the light post. The geographer is the person inside of the author that pointed him in the right direction. Last but not least the flower is the author’s mom. The author regrets leaving her.This is what I think the characters represent. I agree with your explanation because the characters can represent times in the author’s life that he may regret. It makes perfect sense that the author would have regrets about the characters in his book so it may relate to him. The characters could also represent proud moments in the author’s life! overall, great response! I believe that the characters in the story represent different points in the authors life. King- when he thought he had power, but had nothing to have power over. Vain Man-when he thought he needed admiration to be important. Drunkard- when he was confused, and did not know what to do, so he felt as if his life was going in this confusing pattern that did not make any sense. Business Man-when he acted to serious and too into his work, having no time for anything or anyone else. Lamplighter- when he felt as his life had gone by to quickly. Geographer-when he had a whole life to explore but never did. I do thinks that every characters the little prince meet has a meaning of an adult life he learns about. Like the lamplighter he has a job that never gives him a breaker from lighting the lamp. And the the drunkard hides his pain because of his drinking problem. I think the 6 people he met were like, drunk man in real life could be somebody that love to drink.A king would be a person who always wants to be in charge.Vain man is who does everything that want people do fore them.Somebody like a business who only spend there time at work and nothing else.Lamp lighter is someone who hates there job and has nothing,but that to do.Geographer is somebody who has nothing to do about in there ,but to study. All the characters in The Little Prince represent something different . THE BUSINESS MAN- represents someone who take things way to serious and only worry about work . THE LAMPLIGHTER- I think the lamplighters job was somewhat not useful because every few minutes he had to light and put out the fire. THE KING- the king thinks he is the best in the world and really he rules nothing. THE VAIN MAN- Reminds me of people who think they are better than anyone else , like famous people are full of themselves. THE GEOGRAPHER- may have represented how the author wanted to travel but never did. The Little Prince met some wired people that the author maybe met in real life and inserted them in The Little Prince. Maybe the author made them up by people he or she knew or saw. When he went to an office maybe he saw a person just like the Business Man, all focused on his work and not even getting trying to get distracted. Maybe he went to a restaurant and saw a guy by the bar and made him Drunkard,sad disappointed and ashamed.The author had a friend just like the King and made him the King. The Geographer was maybe himself. He might of had an old grandpa that did lamp lighting in his young days and made him the Lamp Lighter. If the author had a son that was vain he made him the Vain Man. All these characters were made because the author may have met before.